There’s a fantastic reason a pig flies atop this charming Wisconsin vacation home’s cupola. 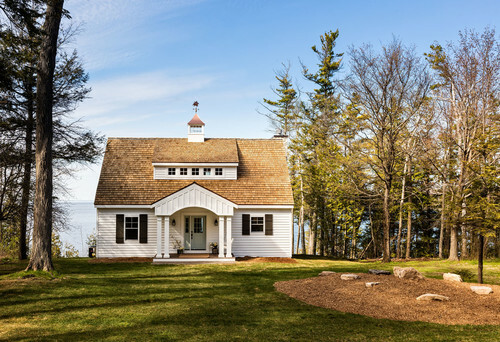 “Years ago one of the homeowners told the other, ‘You’ll have a lake cottage in Door County when pigs fly,’ ” home designer Mitch Wise says. The soaring swine on the weathervane is a reminder that the dream came true. Not that the couple really need one as they catch a glimpse of Garrett Bay each time they pull up to their lovely new cottage. The homeowners had grown up visiting lake houses in the region and had been renting in the area for years, so they had a vision for their dream vacation house. 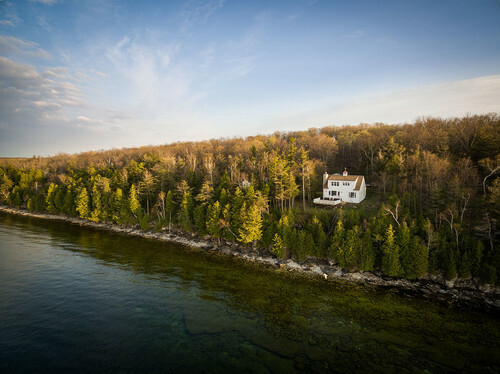 “They wanted a home that would fit in with the classic Door County lake houses and would look like it had always been here,” Wise says. Details like the cupola, shed dormer, cedar shake roof shingles, columns and board and batten on the porch give the home its classic cottage look. It wasn’t all about being classic, though — the clients also wanted to incorporate their personalities. “The homeowners like quirky and eclectic style and wanted their home to reflect that,” Wise says. On this facade there’s just a little asymmetry — the sidelight on one side of the front door and the two different windows — it almost appears as if the house is winking at us. And that pig is definitely winking at us. The home’s design was also about capturing as much of the water views as possible. 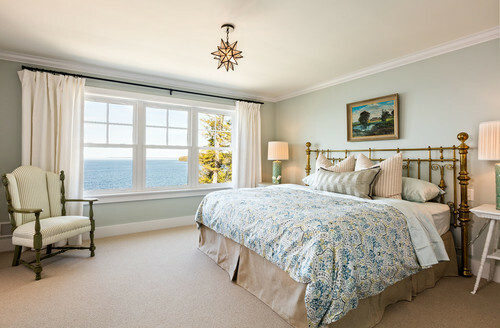 The top floor is all master suite, and the bedroom and bathroom look out across Garrett Bay, located near the tip of the peninsula that separates Green Bay from the rest of Lake Michigan. On the first floor, the living room, dining room and kitchen are open to one another and the views, and a guest bedroom enjoys them as well. 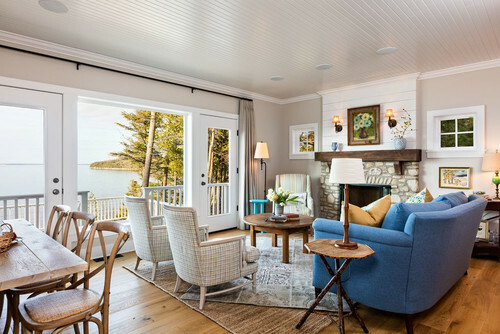 A beadboard ceiling, shiplap fireplace detail and a chimney crafted from local stone create a cozy vibe. Ten-inch French oak planks on the floor lend a sense of age. Wise sought to balance the budget with splurges and saves. While the stone chimney was a splurge, finding great thrifted pieces like this church pew for the dining area was a save. 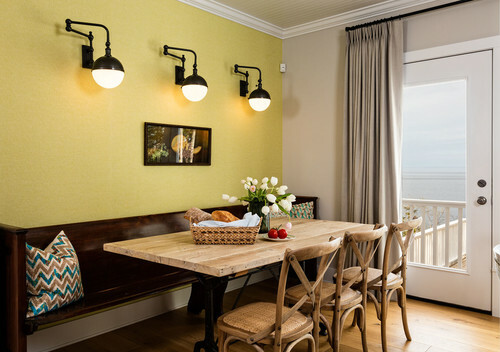 The swing-arm light fixtures add a graphic touch and vintage style. The table pairs a vintage-looking metal base from Restoration Hardware with a custom reclaimed-pine top. The accent wall is covered in grasscloth. 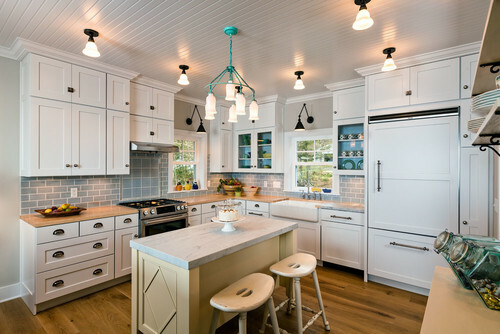 Shaker-style cabinets, classic hardware, vintage-looking ceiling lights and a panel-front refrigerator continue the classic cottage feel in the kitchen. The lack of modern recessed lighting helps sell the idea that the house has been around for generations. The countertops are a mix of Carrara marble and sugar maple butcher block. The homeowners scored the chandelier at One King’s Lane. The gray-blue crackle-glazed subway tile was a splurge. From the back of the house there’s a little path down to the rocky shore. 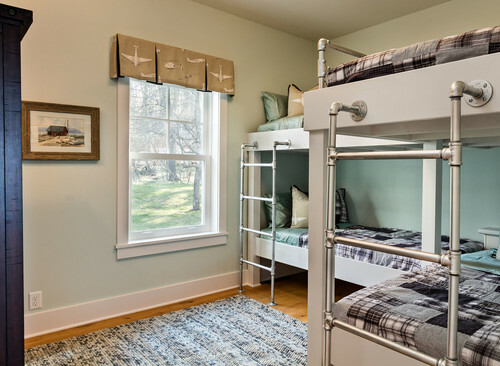 On the woods-facing side of the house, the homeowners maxed out the number of people the cottage can sleep with custom bunks Wise had built on site. The couple often have friends with young children come up, so all the kiddos can have a slumber party in here. The ladders are made from plumbing pipes. “The plumber on the job built those for us,” Wise says. In the master bedroom, an antique brass bed and nightstands add patina. “It’s very peaceful up here. We chose calming colors,” Wise says. The painted pine boards on the floor and standard subway tile saved enough in the master bedroom budget to splurge on a Carrara marble counter. It’s also a nice balance of lake house simplicity and elegance. The windows look out over the bay.